Don't feel like sharing? The SingleNest understands. Pull the SingleNest out of its soft-ball-sized stuff sack, clip it to your handy-dandy Atlas Straps (sold seperately), and settle in for some me-time. Light enough to make the backpacker's cut, but robust enough for backyard luxury, the SingleNest is the go-to for any occasion. The ENO Singlenest Hammock's low weight and compact size make it an excellent choice for backpacking and bike touring. Note: Color combinations may be inverted from what is pictured. Also, select Assorted Earth Colors or Assorted Bright Colors to be sent a random color combination. Unfolded Dimensions: 9'4" x 4'7"
I do not own one, but borrowed a friends for a weekend trip. Slept in the hammock two nights and it was great. 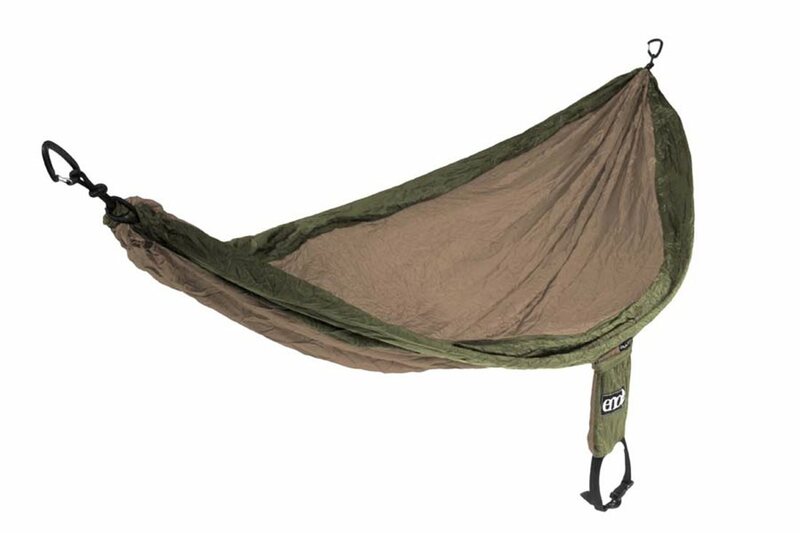 You can flip the top side over and be fully enclosed to prevent bugs from getting to you. I had no bites either night, and trust me this place is full of mosquitos. A friend mentioned sometimes they can bite you through the material if your skin is against it, since the material is thin (not weak though).